Luxury fully equipped two bedroom apartment, superbly located in the �Golden Triangle� between Vilamoura, Vale Do Lobo and Almancil. The prestigious Al-Sakia Village is ideal for those who do not like large tourist developments. The apartment sleeps 4 max. and is on the second (top) floor, comprising hallway, lounge/dining room, kitchen/breakfast room, family bathroom with bidet, en-suite to master bedroom with jaccuzi-bath. One double and one twin bedroom. There is air conditioning & heating and lift access and secure allocated garage parking in the basement. Facilities include a large swimming pool, children�s paddling pool and play area, 2 tennis courts, sauna, gym, restaurant/bar with pool-side terrace. Quarteira 2km, Vilamoura 2km, Loule 7km, Almansil 5km, Faro Airport 15km. Quarteira beach 2km, Trafal beach 2km, 6 restaurants within 1km, Aqua Show 1km, 12 Golf courses within 10km. Vilamoura has a world reknown marina, casino, cinema, shops, bars, restaurants, Roman ruins, etc. & 2 beautiful beaches. Quarteira has a long promenade, shops, restaurants & bars. The beach is wide, clean & well looked after. On Wednesdays, a busy Gypsy market is held. Much quieter is Trafal beach, between Quarteira and Val do Lobo, where pine trees break away from red cliffs to reveal a golden beach . All these are of golden sands, clean and within approx. 5 mins by car. The beautiful Falesia beach (west of Vilamoura) is not much further away. The Algarve is a golfer's paradise boasting 25+ championship courses. 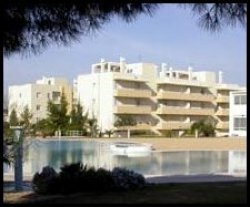 Vila Sol is within walking distance (visible from the apartment terraces). Some 12 golf courses are within 10km distance and the 5 courses in Vilamoura (Pinhal, Laguna, The Old Course, Millennium and Victoria) are all within a 5/10 min drive, as are those at Val do Lobo and Quinta do Lago. Only a 20mins drive away, Faro airport is approximately 2h 40min flying time from Luton, Stansted, Gatwick or Heathrow. Flights are available all year round. Similarly regular flights are available from Manchester & Glasgow. 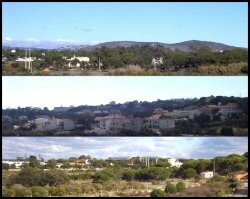 A bus stop is 500 meters from the apartment and services run between Faro and Albufeira stopping, amongst others, in Almancil, Quarteira and Vilamoura. Car Hire Rental can be arranged at very competitive rates (from �55/week) - please contact via the enquiry link for details. 1). Although childen are very welcome, they MUST be over 10 yrs of age and supervised by adults. 2). Smoking is permitted only on the terrace areas, not within the apartment itself. 3). The preferred change-over day is Saturday - at certain times other change-over days may be available - please contact via the enquiry link. 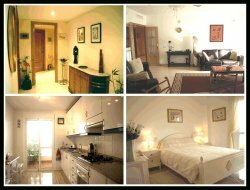 This is our home and it is furnished and equiped to a high standard. For your own benefit/enjoyment and for others, your care and consideration is appreciated. 1). Please note that key availability, management, advice and assistance is available from our apartment managers. 2). Apartment cleaning and linen/towel changes is once per week on a Saturday. 3). Beach/swimming towels are not provided. 4). An instruction and information folder is provided. 5). Airport collection & return can be arranged.